The Skywalker Trampolines are very popular trampolines. Are Skywalker Trampolines good ? 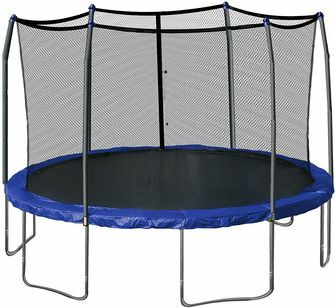 Being an affordable price at around $300, they seem to be a good quality trampoline. Assembly takes about 1-3 hours, depending if you have help or not. If there are two adults putting together the trampoline, it will take approximately 1 hour. If you are putting it together by yourself it will take longer. 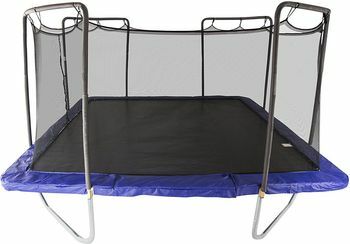 From now on let's consider the 15 foot Skywalker Trampoline with an enclosure. Some people have found the instructions a little confusing, but with careful reading and studying the pictures that go with the instructions, it seems to be fairly easy to put together. The skywalker trampoline does not come with trampoline anchors, which would be a good investment you can get for fairly cheap. It seems sturdy on its own weighing approximately 150 pounds, but if you live in a place with strong winds, it would be recommended to get. That being said, the trampoline as a whole seems to be made with good quality material that can withstand a good amount of weight. The recommended weight limit is 200 pounds, but many people have used it over that and it seems to hold up very well. The springs do not stretch out from being used over the weight limit, and it holds its bounce very well. The zipper enclosure actually comes pre-attached to the mat when it is shipped which seems to be a big improvement over other models. The enclosure has had mixed reviews, where some have lasted 5 years, and some needed to be replaced after a year. Weather would be a big factor in this. Taking the enclosure, trampoline mat and springs of the trampoline down in the winter would go a long way in making it last. The enclosure also comes with foam noodles that cover the poles which seem to get damaged easily, but it is a cheap and easy fix. The bounce of this trampoline is fairly good. It's not the best on the market, but it gives you a very good bounce for the price that you pay. Adults and children alike can get a good jump out of it. People who are well over 200 pounds have jumped fairly hard on it without touching the ground. Since the mat is a good three feet off the ground, there is lots enough clearance for some good jumping experience. The safety net of the Skywalker trampoline goes a long way in keeping you safe. 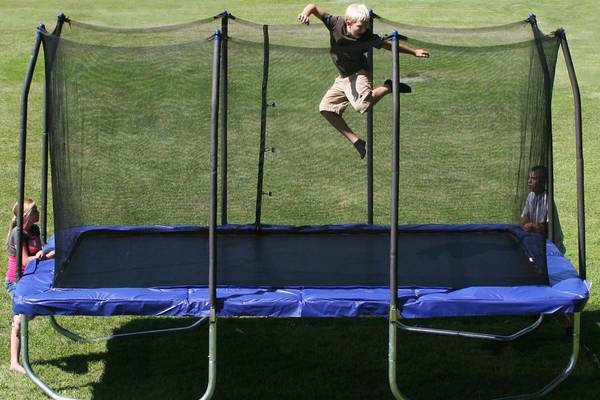 Since the enclosure is attached directly to the trampoline canvas, you won't have people slipping underneath the netting. The doorway has a zipper enclosure so no one will fly out while they are jumping. This model does not have a ladder that comes with it for smaller children to get on and off, but it can be purchased separately for a very good price. You can read more about the safest trampoline here. The warranty on this trampoline comes with one year on the steel frame and ninety days on all other parts from date of purchase. There is no warranty for wind and weather damage, unfortunately. The warranty is also only effective if you buy the skywalker trampoline from an authorized dealer. If you don't buy from an authorized dealer, you will have to contact the company that you bought it from if you have any issues. In conclusion, I'll ask the question again, are Skywalker trampolines good? From safety of the enclosure, to the quality of the construction, I would have to say yes! They are well worth the price that you pay for them. If you are looking for a good quality trampoline for your kids or yourself, then the skywalker trampoline would be the one to get. Happy jumping!